From a distance, woodcocks and snipes look like twins: long beaks; similar bodies; plumage of brown, white, black and gray. Woodcocks and snipes are classified in the same order, Charadriiformes, and they both live in habitats near water or at sea. Woodcocks and snipes belong to the same family, Scolopacidae: the sandpipers and relatives. But the American woodcock (Scolopax minor) and Wilson's snipe (Gallinago delicata) aren't identical. They're cousins whose differences you can see up close. Woodcocks didn't receive necks; their heads sit atop the body. Woodcock aficionados love to watch the mating ritual of male woodcocks --described as a dance in the air. Melodious tunes and a sound referred to as a "peent" flow from the acrobatic male. Woodcocks devour earthworms with their long beaks. The male's beak is 2.5 inches long; the female's slightly longer. Woodcocks have stocky bodies and rounded wings in flight. Until 2002, Wilson's snipe was also called the common snipe; but common snipe now refers solely to the Eurasian snipe (Gallinago gallinago). Compared will woodcocks, snipes have smaller heads and eyes, slender bodies and a neck. 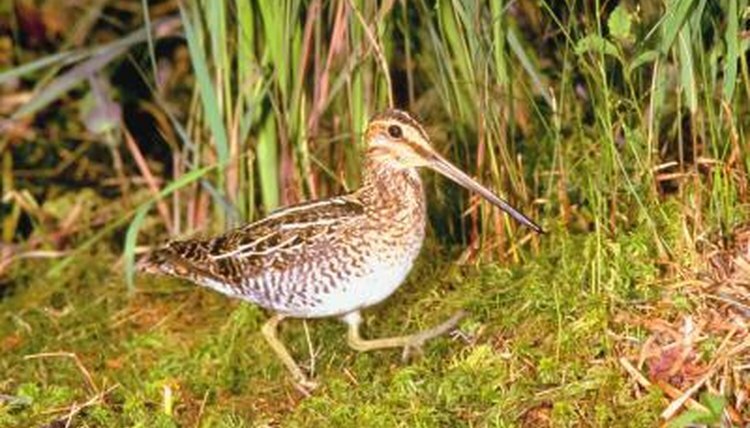 Snipes wear distinctive dark stripes on their heads and backs. Beaks are longer. Males, females and juveniles look alike. Snipes dine on earthworms, insects, mollusks and crustaceans. Male snipes also engage in a flamboyant mating ritual. American woodcocks reside near water in new growth forests. Found year-round in the southern United States; woodcocks breed in northeastern Canada westward to the Great Lakes. Concentrations of woodcocks reside in Mississippi and Louisiana during fall and winter. Wilson's snipe prefers freshwater bogs and marshes. They breed in Canada and Alaska. Winter finds them in the lower 48 states. Some snipes live year-round in the northwest corner of the United States. American woodcocks are also called timberdoodles, night partridges, big-eyes, bog suckers and mud bats. Shorebirds, woodcocks are hunted for sport. The plumage of Wilson's snipes keep them well hidden. You generally won't see snipes until they are flushed from hiding. Snipes' long bills are flexible at the tips. Snipes can control their beak tips without moving the beak near the skull. The flexible beak tips help snipes find prey in the mud.